Anne Nesbet is the author of Cloud and Wallfish, among several other novels for young readers. A professor at the University of California, Berkeley, she lives in the San Francisco Bay Area. In this uplifting, multifaceted historical novel set in 1941, Nesbet (Cloud and Wallfish) creates an arrestingly strong and sympathetic character in nearsighted 11-year-old Augusta “Gusta” Hoopes Neubronner...Nesbet deftly weaves disparate elements—music, orphans, labor unions, carrier pigeons, and a magic wish—into a richly developed story set during a pivotal era in American history. The narrative style is deeply satisfying: unexpected flourishes of drollery grace the text; the theme of Gusta’s new spectacles-enhanced vision gracefully serves as plot point and metaphor; and an ex- amination of folkloric Wishes respects both believers and doubters. Sometimes kids just need a book to cozy up with in an overstuffed chair, a secluded treehouse, or a nest of pillows. This is exactly that book. The dialogue is catchy, and Gusta’s internal monologues share her tremendous curiosity and friendliness with readers. This is a good pairing for Kimberly Brubaker Bradley’s The War that Saved My Life, both for the time period and its sense of pathos...Solid historical fiction with a memorable heroine. She's believably caught between her desire to do what's right, fighting back against growing prejudice against foreigners and unfair treatment of workers, and her need for comfort and security in an alien, sometimes-threatening new environment...this effort nicely captures the myriad faces of prejudice. Sometimes suspenseful and always engaging, this snapshot of determined Gusta and life before the war is sure to captivate readers. Nesbet’s narrative has a lilting quality that makes her storytelling both unique and attractive, and young readers will appreciate her well-rounded characters as well as a small but highly engaging group of antagonists. Nesbet also incorporates factual information of the era to highlight relevant themes of injustice, immigration and the labor movement. 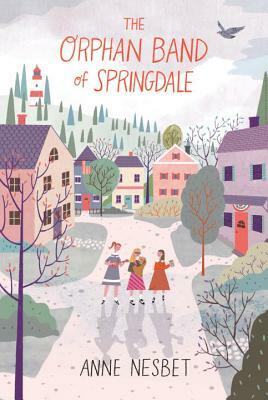 The Orphan Band of Springdale is a heartwarming and educational read. Intelligent, empathetic, and brave up to a point, Gusta is the most complex of the many well-drawn characters whose stories intersect, sometimes in surprising ways. A rewarding historical novel.